Most movies fit into particular genres, with plots that in at least some respects are recycled. There is nothing inherently wrong with this: The same thing could after all be said of almost all of Shakespeare’s plays. But just as The Tempest is refreshing because of its novelty, so too are films with unique stories that one can’t really analogize or trace back to any earlier films, or even to a cinematic genre. Love and Death on Long Island and Junior Bonner are two of my favorite movies of this highly original kind. Another is this week’s film recommendation: Seance on a Wet Afternoon. The film opens as a two-handed play about a strange and strangely compelling married couple. Myra (Kim Stanley) hold seances for her credulous neighbors and is convinced that she has remarkable psychic gifts. Her asthmatic husband Billy (Richard Attenborough) seems afraid to disagree with her. It soon becomes apparent that the two are hatching some sort of bizarre kidnapping and ransom plot, though it would be better said that Myra has hatched it and Billy is too uxorious to resist. Despite the ransom demand, the motive for the planned crime is nothing so simple as money. Many twists of story and anguished human psychology follow, taking the audience on a journey that is suspenseful, dramatic, and ultimately, quite sad. 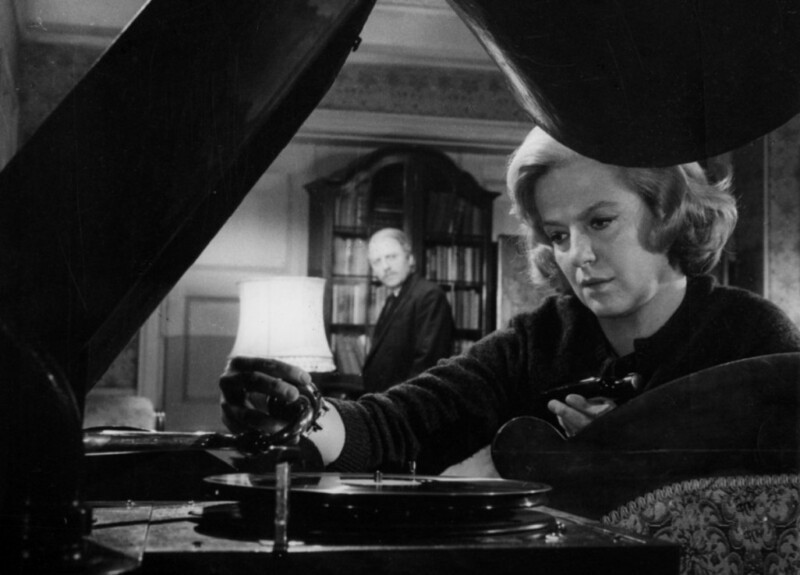 This 1964 film is the most artistically impressive product of the highly successful, long-running collaboration between British cinema worthies Richard Attenborough and Bryan Forbes. The two men took on different roles in their various films; in this case Forbes wrote and directed and Attenborough acted and shared producer duties with Forbes. As producers, the team’s masterstroke was reaching across the pond to cast Kim Stanley, who was then a stage and television actress barely known outside of New York City. As Myra, Stanley gives one of the outstanding performances of the 1960s as the sort of person who is deeply disturbed and fragile yet at that same time exerts enormous power over those around her. Stanley was dubbed The Female Brando by her biographer and she puts on a method acting clinic here in what sadly turned out to be one of few opportunities movie audiences got to see her masterful work. After being nominated for an Oscar for Seance on a Wet Afternoon, she returned to the stage and virtually disappeared from films until 1982, when she garnered another Oscar nomination for Frances. Forbes’ direction and Stanley and Attenborough’s performances are truly above reproach. The way Billy is lacerated by Myra’s every critical remark and disapproving look, yet also clearly loves her and feels protective of her, is beautifully, painfully brought out. Their marriage is not quite a folie Ã deux because Billy retains some grip on reality and decency, which serves to create tension in the relationship and the plot that propels the film forward. Though the script could have been slightly tightened, every line of dialogue rings true and the plot is consistently compelling. Gerry Turpin’s photography is also a virtue, both in the interiors of Myra and Billy’s house but also in, around, and underneath bustling 1960s London. Overall, one gets the sense of a production in which every professional in front of and behind the camera knew exactly what they were doing. Billy and even moreso Myra will haunt your imagination after you see this movie. Don’t miss it.